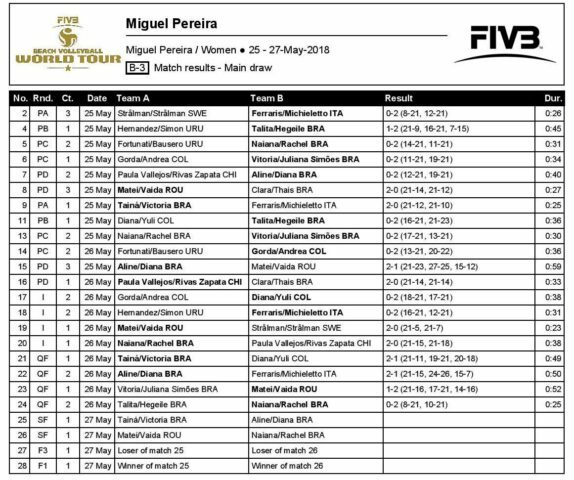 Romania’s Adriana-Maria Matei and Beata Vaida spoiled an otherwise all-Brazilian semifinal party at the Miguel Pereira One Star on Saturday. The fifth-seeded European pair, which has already secured its best ever FIVB World Tour finish ahead of a fifth place at the Aalsmeer One Star in October, earned its spot in the final four with a tiebreak win (15-21, 21-17, 16-14) over Brazilians Vitoria/Juliana Simoes in the quarterfinals. The team began is day with a crushing straight-set win over Jenny Stralman/Therese Stralman of Sweden in Round 1. Brazilians Naiana/Rachel, Taina/Victoria and Aline/Diana round out the race for the podium. 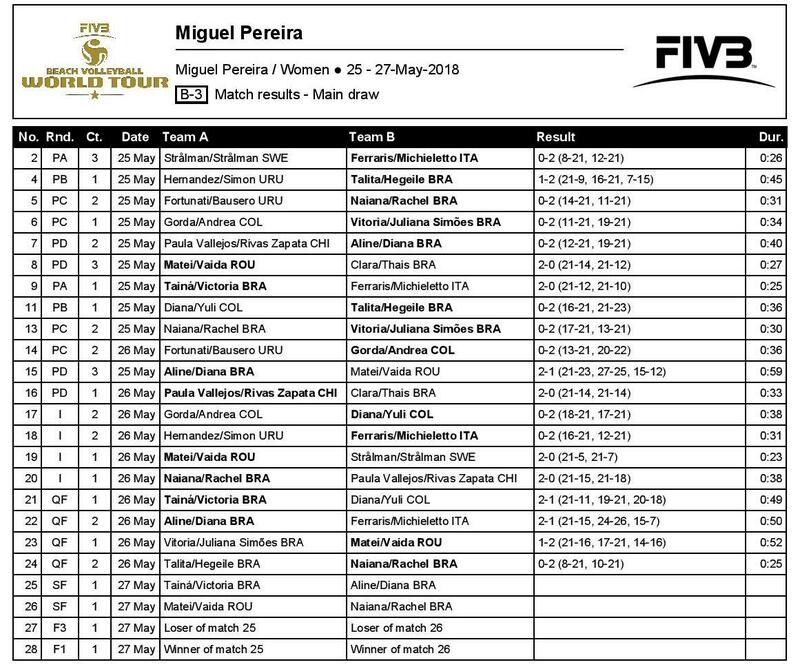 Top seeded Taina Silva Bigi/Victoria Lopes Pereira Tosta are looking for their first FIVB gold medal after joining forces in December 2016 and playing only in continental and national events. Taina played her first FIVB event of the year, the Itapema Four Star with a different partner, Rebecca, last weekend. No. 13 Aline Lebioda/Diana Bellas Romariz Silva and No. 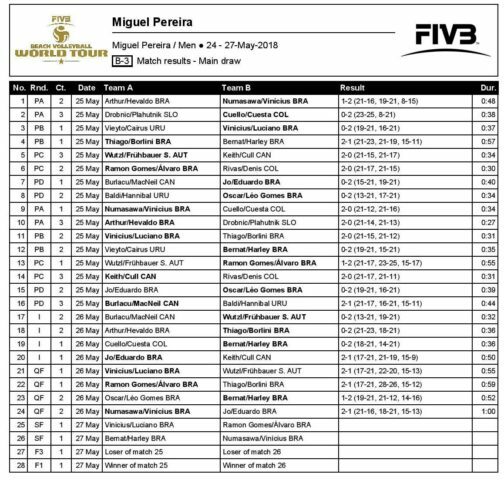 14 seed Naiana Rodrigues de Araujo/Rachel Nunes are making their first FIVB World Tour appearances as pairings. Naiana/Rachel played through a pair of straight set wins over Chile’s Paula Vallejos/Rivas Zapata (Round 1) and countrywomen Talita Calixto Simonetti/Hegeile Almeida dos Santos (quarterfinals). Aline/Diana earned a free pass to the quarterfinals with a pool title on Friday and took out Columbia’s Diana Rios/ Yuli Ayala in an extra-point tiebreak to make the semis. Aline/Diana won 21-11, 19-21, 20-18. On the men’s side, a Brazilian sweep of the podium is guaranteed as all four semifinal spots are held by duos from the host country. No. 6 Ramon Ferreira Gomes/Alvaro Marcelino Santos Andrade, No. 10 Rodrigo Vieira Bernat/Harley Marques Silva, and qualifiers Vinicius Rezende Costa Freitas/Luciano Ferreira de Paula and Felipe Cavazin Numasawa/Vinicius Gomes Cardoso de Araujo make up the field. Bernat/Harley are the lone team of the four to play in Round 1 on Saturday morning, besting Columbia’s Edgardo Cuello/Yhan Cuesta in straight sets to set up a quarterfinal meeting with fellow Brazilians Oscar/Leo Gomes. All four quarterfinal matches went the distance, with Vinicius/Luciano and Ramon Gomes/Alvaro rebounding after dropping the opening set. Vinicius/Luciano took out the lone non-Brazilian team remaining in Austria’s third seeded Jorg Wutzl/Simon Fruhbauer. 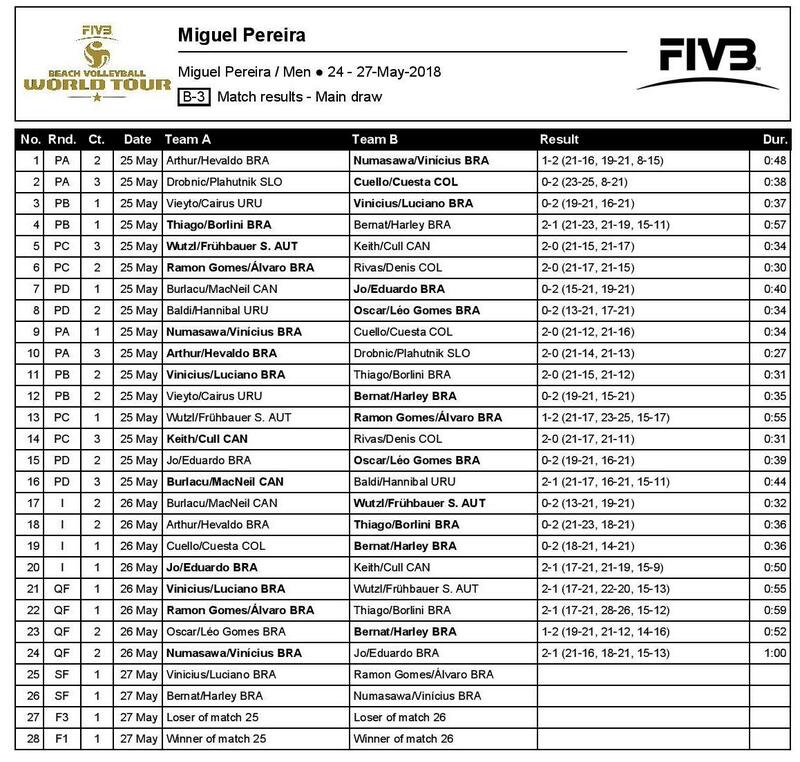 This is the second FIVB tournament for Vinicius/Luciano, who finished 49th at the Huntington Beach Open on May 6. The other three semifinalists are new pairings.